The 2S3 SO-152 (M-1973) “Akatsiya” (Acacia), self-propelled 152-mm howitzer was developed in 1967 in response to NATO’s M109 Howitzer. 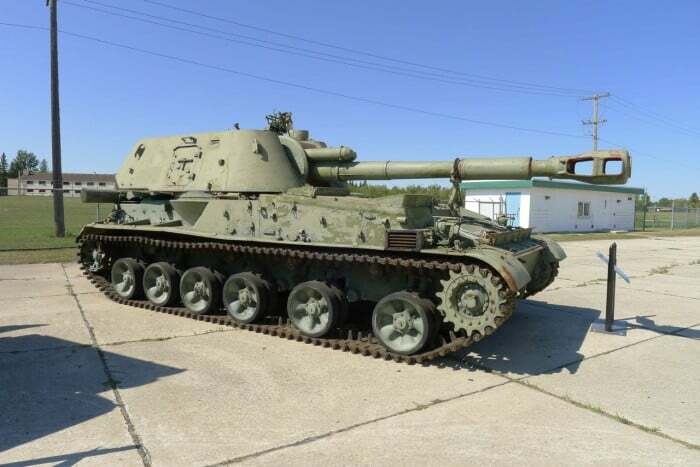 The 2S3 was primarily employed as divisional artillery in Soviet and Warsaw Pact motor-rifle and tank divisions on a scale of one battalion of 18 guns per division. The 2S3 used a wide array of ammunition, including a rocket assisted projectile which had a maximum range of 24,000m. Countries which have used the 2S3 include the Soviet Union and Warsaw Pact nations, as well as Cuba, Iraq, Libya, Syria, Vietnam. Former Soviet states such as Georgia and Ukraine as well as Russia still use the 2S3.